A King of Solar Dynasity Asamanja performed severe ‘Tapasya’( meditation) to Bhagavan Sankara for sons and Queen Vaidarbhi delivered a mass of flesh. Asamanja prayed to Sankara again and he appeared in the form of a Brahmana and cut the flesh into thousand pieces that turned as so many sons. As they attained youth, the King asked them to accompany a Sacrificial Horse for performing Asamanja’s ‘Asvamedha Yagna’. The sons found the Horse was missing on the way, suspected and misbehaved with Sage Kapila in Yoga, who burnt all the thousand of them into ashes. 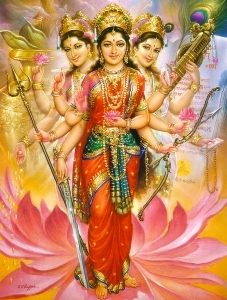 It was the Grandson of Asamanja and the son of Ansuman- the illustrious Bhagiratha, who made persistent efforts to meditate Devi Ganga, Vishnu and Sankara and finally succeeded in bringing the Holy River from Vishnu’s feet to Sankara’s head and down to Bhu Loka and purified the ashes of the thousand Sagara ‘Putras’(Sons) and relieved their tormented souls to Heavens.The Holy River flowing as a ‘Jeeva Nadi’ till date across the entire ‘Aryavarta’ from Gangotri to the Bay of Bengal, is a unique land mark of Bharata Varsha, blessing lakhs of devotees for bathing and purifying their sins at several points dotting from Haridvar, Varanasi, Prayaga and Patna. Even a mere bathing in the River washes off several sins, and performing it with a ‘Sankalpa’or resolve especially on a day when Sun passes from one Zodiac Sign to another bestows significance thrice over. Bathing on a New Moon day according to Rituals provides further importance and on the day when Sun changes course into the ‘Dakshinayana’ phase is definitely beneficial while bathing on the day of ‘Uttarayana’ course would be twice over in destroying accumulated sins.‘Ganga Snan’during the ‘Chaturmasya’ period, on ‘Akshaya Tritiya’ or ‘Akshaya Navami’, during ‘Parva’days of ‘Dussehra or Vasanta ‘Navaratras’, especially on the Tenth day, Pongal days, ‘Magha Sukla Saptami’, ‘Bhishma Ekadasi’, Sri Rama Navami, Solar or Lunar Eclipse days, and Maha Varuni day are good examples of the Sacred Bathing in Ganga. Let alone the bathings, especially on a few of the days mentioned above, even a sincere and hearty shout of Ganga, Oh Ganga would bestow fulfillment of one’s material desires, even from a distance.